Copycat Printing provides value-added printing services to our customers by exceeding their expectations and gaining their trust through exceptional performance by every member of the team throughout the printing process. Our pledge is to provide strategic counsel, creative solutions and timely, responsible services. 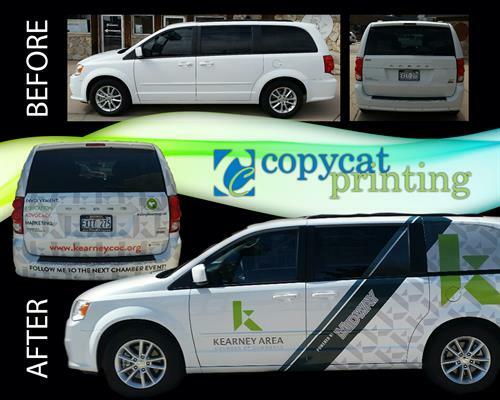 Copycat Printing of Kearney, Nebraska was formed in September of 1988. We are locally owned and operated and pride ourselves on being a complete source for all your printing and communication needs. Our full service print shop and copy center is second to none. We have a trained and experienced team that will provide you expert consultation on every project no matter what the size. From design, copying, printing, finishing, mailing services and oversized prints we do it all professionally and personally every time. We provide you, our customer, with a full line of services in our printing, copying, bindery,blueprint/wide-format copies, graphic design and typesetting departments. Stop by our conveniently located downtown office, you?ll find our knowledgeable and experienced staff ready to serve you. You will have a clear conscience knowing that your printing needs are being handled by sales and production professionals. At Copycat many services are offered to make your job easier and hassle free. The fact that all of our services are accomplished under the same roof means less stress and less chance for error. Our quality service makes us stand out from all the rest.